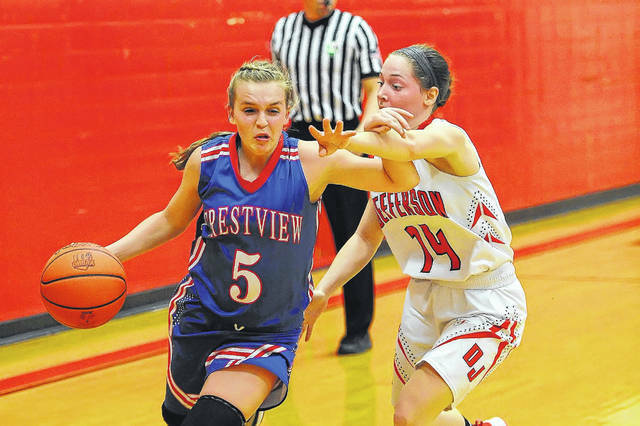 Crestview’s Lexi Gregory drives against Jefferson’s Devyn Carder during Thursday night’s game in Delphos. See more game photos at LimaScores.com. Jefferson’s Alli McClurg puts up a shot against Crestview’s Lyvia Black during Thursday night’s game in Delphos Jefferson High School. DELPHOS — Delphos Jefferson kept turning the ball over against the Crestview zone in the first half. But the Wildcats settled in and made key plays down the stretch. Delphos Jefferson posted a 52-49 girls basketball Northwest Conference victory Thursday night against Crestview. Crestview led 28-21 at the half, but the game went back-and-forth the entire fourth quarter. Sarah Miller gave Jefferson the lead to stay 50-49 with a free throw with 18 seconds left. Macy Wallace’s two free throws made it 52-49 with 1.6 seconds left. “We knew we had to go out and play our hardest to stay undefeated in the NWC,” Wallace said. Paige Motycka missed a halfcourt shot at the buzzer and it was over. Delphos Jefferson is 10-3, 3-0 in the Northwest Conference. Crestview is 6-5, 2-2 in the NWC. 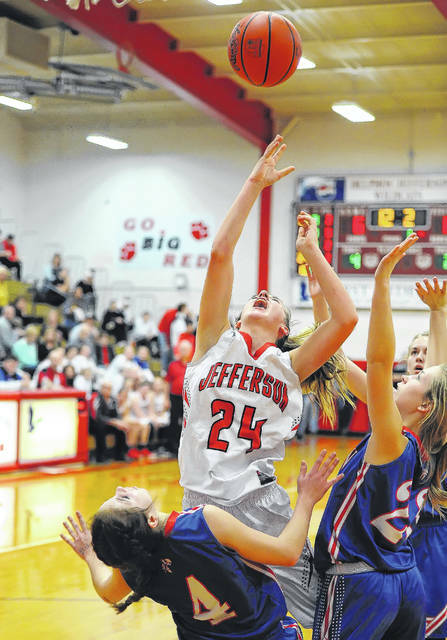 Alli McClurg led Jefferson with 12 points and seven rebounds. Wallace had eight points. Miller had seven points and seven boards for Jefferson. “We got a lot of contributions from a lot of people, which we needed,” Hoffman said. Lexi Gregory paced Crestview with 11 points. Lyvia Black scored nine. In a see-saw final five minutes, Gregory hit a 3-pointer to push Crestview on top 44-41 with 3:15 to go. At one point, McClurg hit the floor for a loose ball to the left of the lane. She got it and shoveled to Miller for a layup. That gave Jefferson a 49-47 lead with 52 seconds left. But Black hit two foul shots and it was tied a 49. Crestview’s Paige Motycka entered the night with 980 career points. She scored seven to give her 987. And while she was held to four points in the first half, her teammates helped her out from various parts of the floor. Crestview had four 3-pointers at the half, with Gregory hit two. Both teams had plenty of half-court zone early. And Crestview did the best job solving the zone as it took a 14-7 lead after the first quarter. The Knights’ halfcourt 1-2-2 trap definitely threw Jefferson out of sync. The Wildcats had nine first-quarter turnovers and 14 for the half. Jefferson finished with 21 turnovers. Crestview had 15. From the second quarter on, Jefferson went mostly man with Wallace watching Motycka. “Macy (Wallace) did a great job on her tonight,” Hoffman said. “We usually play a zone. We couldn’t do it, so we went man. We haven’t played much man all year. Jefferson also controlled the glass, winning the boards, 37-27.